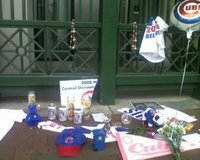 RIP Chicago Cubs 2008…A Letter from a very OLD Man | Have Game? Will Travel! I have a lot of pressure to comment on the the sweep of the Chicago Cubs in the playoffs. In the past few days, after escaping from my self-imposed hibernation, people have hugged me, apologized and offered their polite condolences. They have also been egging me on for some kind of commentary- perhaps a eulogy to the 2008 Chicago Cubs. I find that there are not many words that can do justice to this crushing loss – although given the shrine at the bleacher entrance of Wrigley Field, I am not alone in coming to terms with the shocking death of the Chicago Cubs’ season. On Sunday, I stood at this memorial for meaning and comfort but mostly, I just sensed anger, torn signs and empty beer cans. For some reason, this loss feels different and more personal than years past. 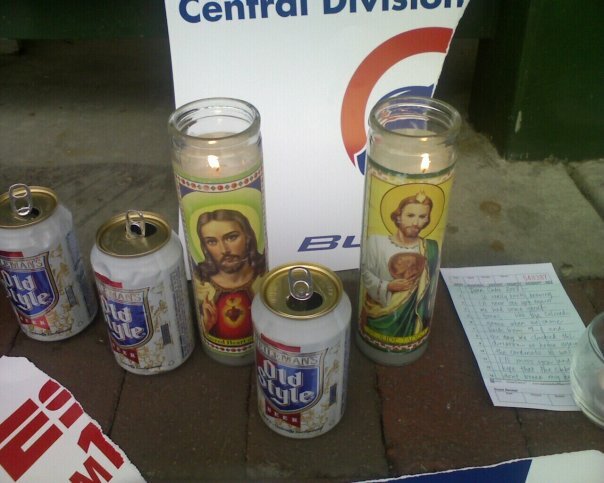 In years past, Cubs fans felt lucky to be in the playoffs so any win was a lucky bonus and any loss was a bit expected. Again, the Cubs were just happy to be there. This year, with talent, luck and a season going our way, Cubs fans hopes were raised higher than ever before only to be dropped to the depths of despair. On a personal level, it is hard to comment on the emotional toll of this loss. There is anger, sadness and disappointment and no, you can’t go to counseling for this stuff. But, to capture the pain and anger of a Cubs loss, I thought that I would publish a note from a very OLD Cubs fans who has been waiting a very long time for a Cubs World Series. This is a picture of Andrew’s Pop-Pop during the regular season. He is 86 years old and was optimistic for the post-season. 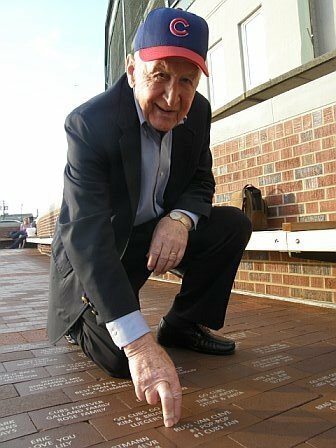 You can see the joy and happiness in his face outside of Wrigley and posing next to his Cubs paver that reads “#1 Pop Pop, #1 Cubs Fan.” Now, read the following email that I received just a few days ago. Dear Andrew and Nicole – tx for note. The straw has now broken the camel’s back – the Cubs no longer exist. Just a bunch of bums. How could they be so bad? I hope the air around your house was not poisoned. You don’t even want to see the new, angrier picture of dear ole’ Pop Pop. Cubs, you have done it again. You have broken the hearts of your loyal fans and in our sick codependency, we come back for more every year. Thanks for the pleasure and the sadistic pain of watching you play. 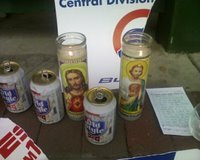 RIP Chicago Cubs 2008…may you rot with the Bartmans, Black Cats and Goats of our past.